— SpaceShipOne, the first privately funded, crewed vehicle to reach space, became part of the United States' national collection of flight icons on Wednesday (Oct. 5) during a donation ceremony at the National Air and Space Museum in Washington, D.C. The spacecraft, 28 feet in length with a 27-foot wingspan, went on display today suspended from the ceiling of the museum's Milestones of Flight gallery, home to many of the "firsts" of flight. It hangs between Charles Lindbergh's trans-Atlantic "Spirit of St. Louis" and Chuck Yeager's Bell X-1, with which he broke the sound barrier. Paul Allen, the sole funder of SpaceShipOne and the co-founder of Microsoft, made the donation while Burt Rutan, the spacecraft's designer, took part in the ceremony. "It is really gratifying to have the SpaceShipOne project recognized by the Smithsonian when it was just 10 years ago we first started researching the possibility of private space travel," Allen said. "I saw SpaceShipOne as a great opportunity to demonstrate not just a proof of concept but also demonstrate that private space exploration could be within the reach of individual citizens." "It is my hope that SpaceShipOne's new home will enable the millions of National Air and Space museum visitors to view, learn about, be inspired, and actively contribute to the next generation of space exploration initiatives," said Allen in a statement released by the museum. 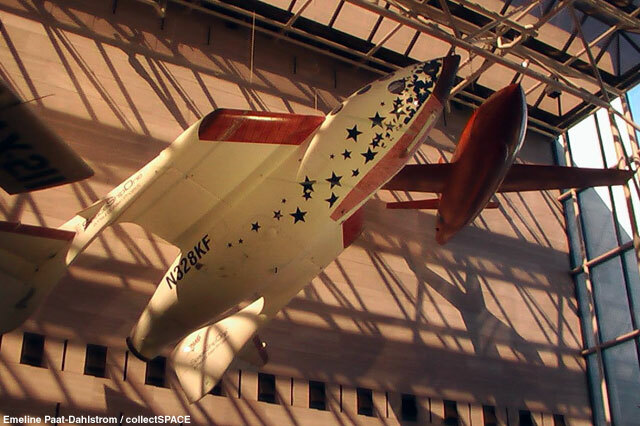 On June 21, 2004, SpaceShipOne achieved an altitude just above the internationally-recognized 62-mile (100 km) boundary of space on an arced suborbital flight that began with it being dropped from its White Knight mothership. It marked the first time that a private enterprise crossed the threshold of human spaceflight. 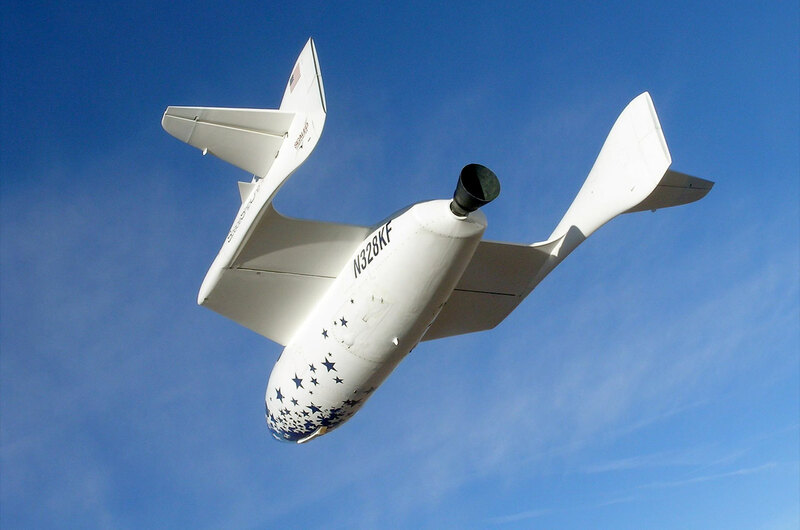 In the fall that same year, SpaceShipOne flew above 62 miles during two flights separated by two weeks, capturing the $10 million Ansari X Prize. The SpaceShipOne team was honored with the 2004 Collier Trophy, awarded by the National Aeronautic Association (NAA) for the "greatest achievement in aeronautics or astronautics in America." Allen, Rutan and the team were also awarded the National Air and Space Museum Trophy for Current Achievement. "The SpaceShipOne represents the next step in traveling beyond our planet," museum director General J.R. "Jack" Dailey said. "Hanging in the 'Milestones [of Flight]' gallery, it'll inspire the next generations eager to experience a new accessibility to space. We are fortunate to add this most significant craft to the world's premier flight collection." 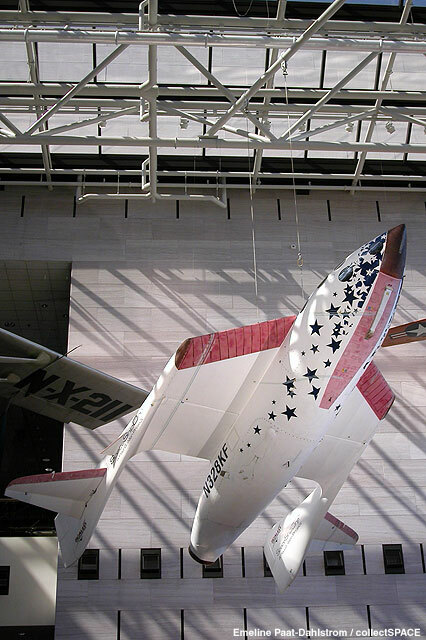 Before being brought to the museum, SpaceShipOne was restored to appear as it did after its first spaceflight, sans the X Prize markings but with recreated damage similar to what it sustained in June 2004. The vehicle is complete, less an unspecified component donated to the team now building an unmanned probe destined to Pluto. With the addition of SpaceShipOne, the National Air and Space Museum is introducing a new style of kiosk in the Milestones gallery, allowing visitors to view video footage of the vehicle in flight, explore its historical context, hear from its sponsor, designer and pilots and study its cockpit via 360-degree high-resolution photography. The kiosks will also feature still photos and concise labels describing the artifact's accomplishments, design features and team of people behind it. 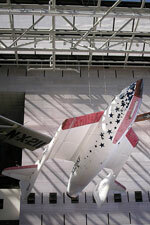 SpaceShipOne is the fifth Rutan-designed vehicle to enter the national collection. The museum's south lobby gallery features Rutan's Voyager aircraft, which in 1986 made the first nonstop, nonrefueled flight around the world. Emeline Paat-Dahlstrom contributed to this report. — The Smithsonian Institution's National Air and Space Museum will become the permanent home of SpaceShipOne, the first privately built vehicle to reach space, a milestone toward development of tourism beyond Earth's gravity. 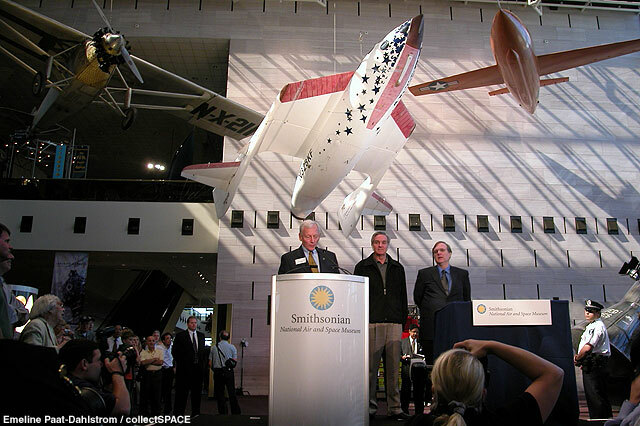 Paul G. Allen, Microsoft co-founder and the sole funder of SpaceShipOne, announced plans to donate the vehicle to the Smithsonian during the annual National Air and Space Museum Trophy awards ceremony held last night. 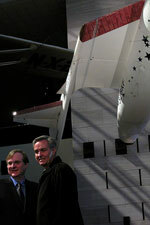 Allen, Burt Rutan and the SpaceShipOne team were the winners of the 2005 Trophy for Current Achievement. 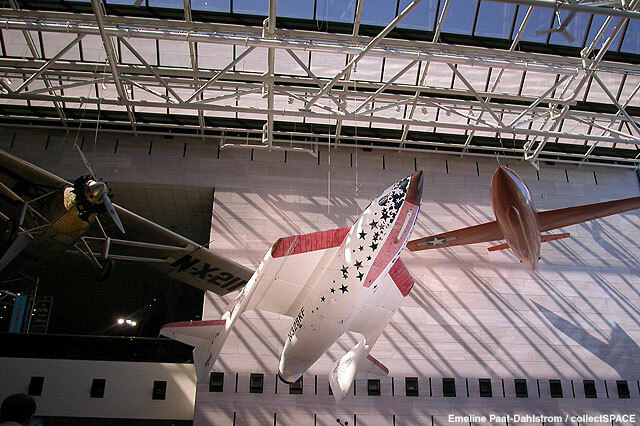 Plans call for SpaceShipOne to arrive at the museum's flagship building on the National Mall in Washington in late summer. It will hang in the museum's Milestones of Flight gallery between Charles Lindbergh's Spirit of St. Louis and Chuck Yeager's Bell X-1. "Today is a day of affirmation," Allen said. "It reminds us that almost anything is possible with a great team and a worthy challenge." 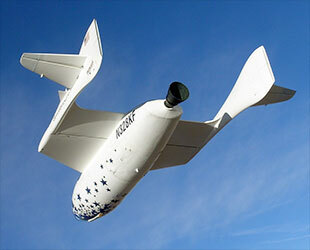 SpaceShipOne is the first privately owned and operated spacecraft to exceed an altitude of 62 miles twice within a period of two weeks, a feat that captured the $10 million Ansari X Prize that encouraged the development of space tourism. On Oct. 4, 2004, pilot Brian Binnie took SpaceShipOne 70 miles (112 kilometers) above the Earth. On Sept. 29, pilot Mike Melvill flew to an altitude of 64 miles (102 km) above Earth. 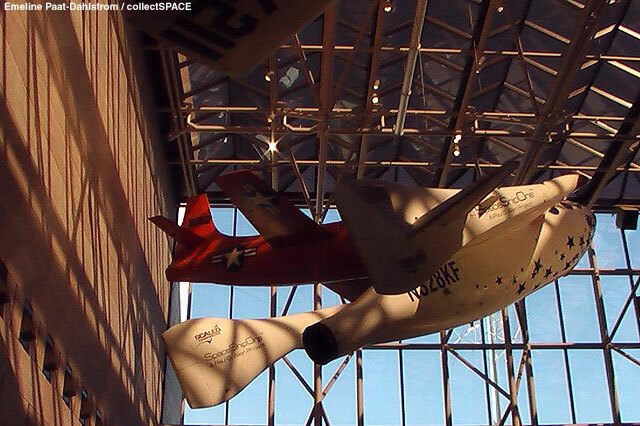 SpaceShipOne flew previously on June 21, 2004, with Melvill piloting and exceeding an altitude of 62 miles. Although equipped with three seats, SpaceShipOne has only been flown solo. To qualify for the Ansari X Prize, it carried the pilot and the equivalent weight of passengers. Its design, featuring a bullet-shaped forward fuselage and splayed wings, will be studied for use with larger space tourism vehicles. Expressing his gratitude for the SpaceShipOne donation, museum director J.R. "Jack" Dailey said, "Our collection is a celebration of firsts. Paul Allen, Burt Rutan and their team are the kind of visionaries who unlock the mysteries of flight and create new ways for us to explore our world and beyond." SpaceShipOne will be the fifth Rutan-designed vehicle in the national collection. The National Mall building's south lobby gallery displays his Voyager aircraft, which in 1986 accomplished the first nonstop, non-refueled flight around the world.